We don’t think much of electricity or the wonders of its generation and distribution until a particularly bad storm descends and suddenly we need our cars to charge our phones, our grills to cook our food, and if we’re lucky, our still-connected friends to lend us their hot showers. 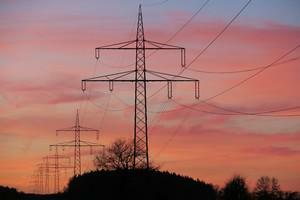 The reality is that our electric grid represents a delicate balance. Energy demand—whether for a month or a morning—must be accurately forecasted. Power plants generate the electricity that will supply that expected demand. Substations step up the voltage of that electricity so it can travel efficiently over long distances through transmission lines. That voltage is then stepped down at another substation to allow distribution lines to transport power throughout neighborhoods and communities. The grid is an intricate, highly complex system. One that has gotten even more complex with the increasing use of renewable energy resources like wind and solar. At some point, something will go wrong. A line will get cut. A generator will fail. There might be a hurricane or a cyberattack. How do you quickly correct for that failure to avoid a cascading blackout? The Advanced Research Projects Agency-Energy (ARPA-E) at the Department of Energy is looking for better answers to that question, in the form of new algorithms. And Frank E. Curtis, an associate professor of industrial and systems engineering at Lehigh University’s P.C. Rossin College of Engineering and Applied Science, and his team think they might have a solution. “Using an active set optimization method, we think we can exploit the idea that when you lose something, maybe not a big generator, but when you lose certain lines, things don’t always change that much,” says Curtis, whose research focuses on the design, analysis, and implementation of numerical methods for solving large-scale nonlinear optimization problems. He is also affiliated with two of Lehigh’s new interdisciplinary research institutes, the Institute for Cyber Physical Infrastructure and Energy (I-CPIE) and the Institute for Data, Intelligent Systems, and Computation (I-DISC).